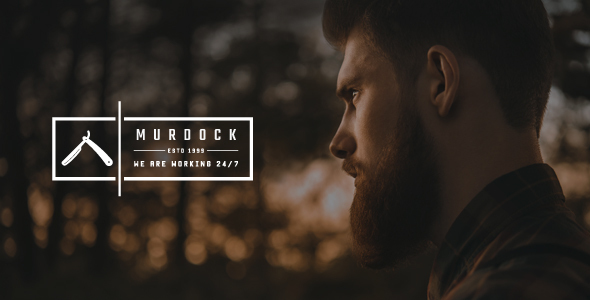 Murdock is a Wordpress theme for barbers shop, professional hair salons, and for any artist related with the barber industry that want to show his talent and skills to the world. Built on the Advanced Bootstrap 3 framework with HTML5 / CSS3. Its responsive too â€“ Will fit great on all devices. Murdock is 100% responsive, each and every element including the awesome slider are fully responsive. Responsive Valid HTML5 and CSS3, Cross browser compatible. Murdock is like one big puzzle â€“ all elements of the site are designed highly modularly so you can build webpage and customize it according to your needs and taste. Have you ever been at the bottom of a webpage and wanted to go to another page, but didnâ€™t want to scroll all the way back up to the top to select a menu item? With Murdock sticky header, you no longer have to do that. Your main menu and logo will always be at the top of the screen, automatically following when you scroll. Our aim was to make your work with template easier so we created detailed documentation where you can find all the tutorials for working with Rebirth. Includes a slider and HTML content. It also supports media like youtube, vimeo, etc. If you need technical support or have any questions, please send us a message via our profile and weâ€™ll get back to you as soon as possible. All images are for preview purposes only and are not included in the download files.